HAIs impact 1.6 million people in US hospitals each year and are associated with high morbidity and mortality (nearly 100,000 annual deaths), prolonged length of stay, and a staggering $5.7 billion in healthcare costs. Despite mandatory HAI reporting along with non-payment for hospital-acquired conditions, there is no specific guidance on how hospitals can reduce the HAI rate. Stewardship principles are critical for appropriate HAI management. There is an increased importance of the interdisciplinary healthcare team—physicians and pharmacists—caring for and managing patients with or at risk of HAIs. Pharmacists are being asked to lead the HAI management efforts by partnering with physicians and contributing to the decision-making process to ensure quality of care and patient safety. In particular, pharmacists have to apply the antimicrobial stewardship principles to optimize the use of available agents and maintain their effectiveness for current and future infections. The “Zero Tolerance” Initiative aimed to empower health-system pharmacists with practical knowledge to successfully manage HAIs by addressing specific process-related issues in HAI management. Indepth Pre-Activity Interview Survey of regional pharmacists along with expert consultation resulted in design of the live program at 10 state SHP annual meetings. The Initiative reached over 1500 healthcare professionals across the United States. During the Live Workshop, evidence-based scientific presentations were followed by a case workshop where faculty and learners partnered to address issues in managing HAIs. The case workshop allowed formative assessment and presented opportunity to address learner knowledge and competence gaps by putting scientific evidence in clinical perspective. Learner experience was further enriched through ‘antimicrobial stewardship meeting’ simulation. The simulation provided a real-world preview of barriers healthcare professionals face while implementing stewardship practices and policies. 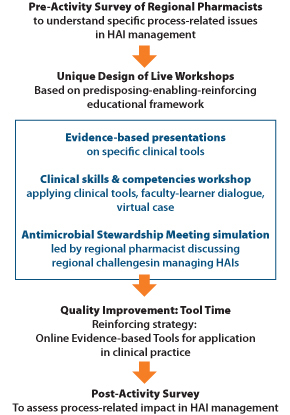 Formative assessment during the live workshops and summative assessment of evaluations were used to design the reinforcing strategy Quality Improvement: Tool Time. This online tutorial series reinforced practical application of tools and competencies acquired during the live activity. Each Tool was a combination of faculty commentary on essentials in clinical practice and links to relevant scientific publications. This was followed by a detailed Post-Activity Survey to assess specific process-related changes adopted by healthcare professionals. "provides participants with an opportunity to witness how complicated back-room discussions can help pave the way to implementing important stewardship policies at institutions." "a unique approach . . . helps participants understand both the formal and informal process of implementing new policies at hospitals." "This approach is extremely valuable to my practice and increased learning potential and retention." Learners were asked if they intended to incorporate any tools suggested in this initiative in their practice. 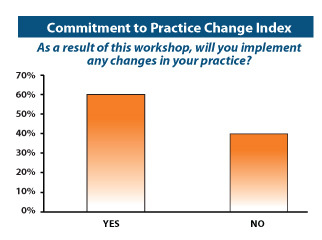 About 60% of the learners committed to making practice-based changes and specified changes they would incorporate in 3 months, 6 months, and 12 months. Did Commitment Translate into Specific Practice Changes? Learners committed to making practice changes, incorporated specific changes based on direction provided during the Live Workshop and through Quality Improvement: Tool Time. Majority of the respondents emphasized an improvement in their interprofessional communication as a result of this Initiative. 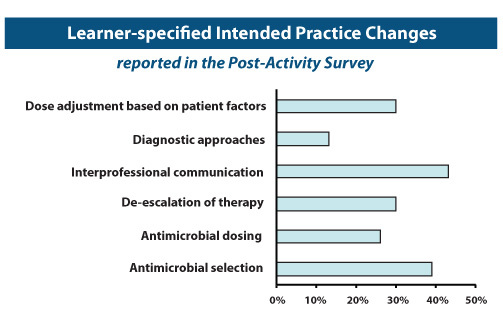 Other major areas on improvement were antimicrobial selection and dose adjustment based on patient factors. 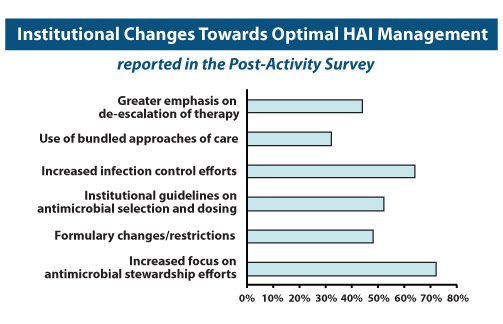 Institutions are moving in the right direction in optimal HAI management as evidenced by increased emphasis on antimicrobial stewardship efforts at majority of institutions. 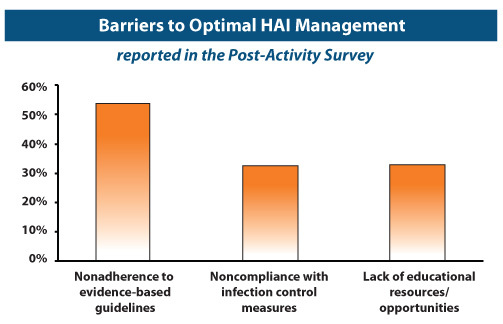 However, barriers to optimal HAI management continue to exist. Fortunately, the nature of these barriers as documented in this Initiative is such that they can be addressed by targeted educational interventions.